REMEMBER WHEN GRAND COUNTY WAS GREEN? It wasn't that long ago that our pine trees were still healthy and vibrant. Each year we continue to lose more trees. This year it is expected to total over two million acres of dead trees. Perhaps you've even suffered a loss of trees on your land. Maybe you're seeing neighbors you couldn't see before. The loss of privacy and the loss of beautiful trees can hinder the enjoyment of secluded, mountain living. But you don't have to accept the new views and barren landscape. GreenScaping, Inc. is a division of Archer Dream Homes, owned by Toby Dellamano. Since 2001, Toby and his landscaping team have been making dreams come true for homeowners through completely custom homes to small remodel projects. When Toby had trouble finding an affordable landscaper to landscape his own home, he realized there must be others that felt the same way. That is when Toby decided to expand into the landscape business. An engineer by education, Toby takes a systematic approach to all projects and understands the importance of balancing creativity with scale & aesthetics. Toby has done business in this valley for over eight years and is known for his trustworthiness, creativity, and efficiency. In fact, Toby’s excellence has been recognized locally with the receipt of the following awards: Best Builder, Best Construction, and Best Furnishings in the Grand County Parade of Homes in 2008. Creating a beautiful landscape doesn’t have to take a season or cost an exorbitant amount. By blending your needs and wants with landscape elements that work for the elevation of your land, the landscape project will look great, add value, provide additional privacy, and perhaps most importantly, restore what the beetle has destroyed. Toby Dellamano has been providing customized service to Grand County for nearly a decade and GUARANTEES his work. If you are not satisfied, we will make it right. We live, work, and play in Grand County and we stand behind our work. Rest assured, we have a solid reputation and it’s important to us that you are completely satisfied with the finished result. GreenScaping, Inc. can help and can take the pain out of losing what we all love and what attracted us to this area. 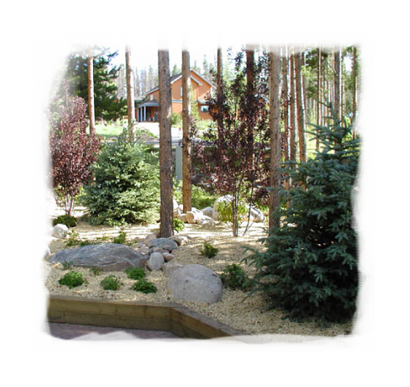 GreenScaping, Inc. is your key to bringing back the beauty that made Grand County grand.